It’s not unusual to find Cissie Giresi at work in her W. Sylvania Avenue salon in Neptune City at 6 a.m. By then, she’s already had a workout at the nearby Retro Fitness center where she generally starts her daily routine. 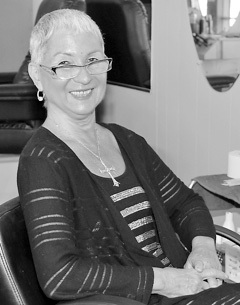 In October, Giresi celebrates the 30th anniversary of the opening if Cissies Touch of Class Hair and Nail Salon at 201 W. Sylvania Ave. She opened the salon after working for 15 years at other shops, including the Hamilton Barber Shop and at the Glemby’s salon at Sears. Giresi sad she was encouraged to go into business for herself by her husband Sal, who she says told her “go for it.” Sal Giresi died in 2005 and Cissie continued on running the business. She has remodeled the shop three times over the years, and now has five chairs and a special chair for pedicures. The salon offers full service hair and nail care, including pedicures, manicures and perms. She now has one other person working for her but over the years has had four longterm operators, who have all retired. Giresi is a native of Neptune and graduate of Neptune High School. She’s been called Cissie since childhood, growing up with her twin brother, Dom Vetrano and sister, Betty Ann Palumbo. She went to night school to be licensed, and even made house calls in the early days, a practice that’s unheard of today. Her greatest satisfaction comes from the customers, some of them have been coming to her for 45 years, starting from her first job at the Hamilton Barber Shop. She relies primarily on word of mouth to get new customers. Giresi says she has no plans to retire and is grateful for her good health and successful business. “Your health is the biggest gift in your life,” she said. Posted in Shore Communities and tagged Avon, Ed Salvas.